The End of the Age, or the End of Time? In the previous installments, Dave Curtis, of Berean Bible Church has shared with us the facts that the Bible never predicted the end of time. Instead, the Bible invariably spoke of “the end of the age” and the time of the end. This is installment #5 in this important series, so, be sure to read the entire series, beginning here. Hebrews 10:37 (NKJV) “For yet a little while, And He who is coming will come and will not tarry. (DKP– Dave now poses a critical question for us all to ponder, in light of the fact that the end of the age came in the first century. AFTER THE END OF THE AGE, WHAT AGE DO WE LIVE IN? We now live in what was to the first century saints the “age to come.” When most Christians read in the New Testament and see the words “the age to come,” they think of a yet future (to us) age. But the New Testament writers were referring to the Christian age. We live in what was to them the “age to come,” the New Covenant age. 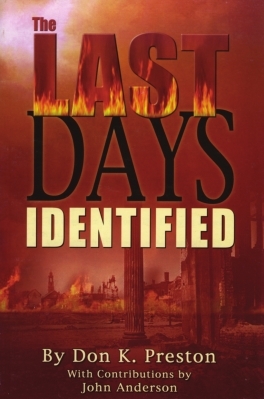 Be sure to get a copy of The Last Days Identified, for more proof that we are not in the last days, and the consummation of the age is not near. For proof that the end of the age is not near, you need to get a copy of this book! Mark 10:29-30 (NKJV) So Jesus answered and said, “Assuredly, I say to you, there is no one who has left house or brothers or sisters or father or mother or wife or children or lands, for My sake and the gospel’s, 30 “who shall not receive a hundredfold now in this time; houses and brothers and sisters and mothers and children and lands, with persecutions; and in the age to come, eternal life. We live in the “age to come,” we have eternal life now! DKP– Just think of how wonderful it is to realize that the end of the age is not in our future! Next Next post: The Four Blood Moons| Is John Hagee Hedging?